Osteochondral lesions of the talus (OLTs) are common cause of postresidual pain after ankle injury. The “gold standard” has not been established over the years, which is why a variety of different methods of cartilage lesion treatment have been used. Microfracture and bone marrow stimulation, although offered fast return to sports, had worse results in a long-term follow-up. Autologous chondrocyte implantation (ACI) was a next step in treatment of OLTs. However, it is a complex and invasive two-step surgery that requires arthrotomy and, in most of the cases, a medial malleolus osteotomy. Furthermore, the cost of the full procedure is high. 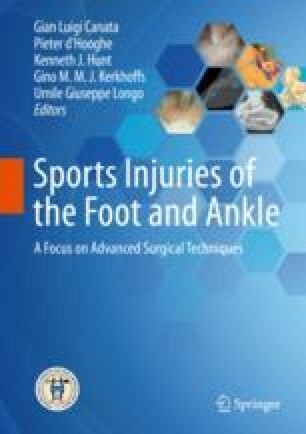 The evolution of tissue engineering and scaffold development provided an opportunity to change the surgery technique. A single-stage procedure with the use of hyaluronic acid-based scaffold combined with bone marrow-derived cells has become an alternative to the aforementioned techniques offering a good clinical outcome and satisfactory long-term results.